MANILA, Philippines - Tech giant Apple unveiled today, June 9 the iOS 9 with software update later this year and officially launched the Apple Music, a revolutionary streaming music service with the pioneering worldwide live radio station from Apple broadcasting 24 hours a day. In this upcoming release, iOS devices become more intelligent and proactive with powerful search and improved Siri features without compromising users’ privacy. New multitasking features designed specifically for iPad allow you to work with two apps simultaneously, side-by-side or with the new Picture-in-Picture feature, to keep watching a video while browsing the web, composing email or using any other app. 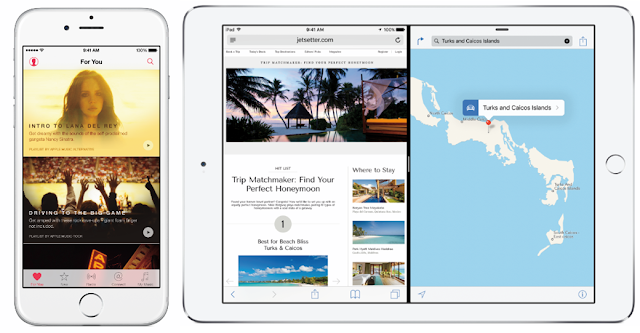 Built-in apps become more powerful in iOS 9 with detailed transit information in Maps, a redesigned Notes app with new ways to capture ideas, and an all-new News app for the best news reading experience on any mobile device. Apple Music combines the largest collection of music with the expertise of world-class music experts who have programmed playlists for your iPhone, iPad, iPod touch, Mac, PC, Apple TV and Android phones. Apple Music will be available starting on June 30 in over 100 countries. Beats 1, Apple’s first ever live radio station dedicated entirely to music and music culture, will broadcast live to over 100 countries. Beats 1 is a 24-hour listening experience led by influential DJs Zane Lowe in Los Angeles, Ebro Darden in New York and Julie Adenuga in London. Starting on June 30, music fans around the world are invited to a 3-month free membership, after which a $9.99/month (Php449.55) subscription fee will apply. There will also be a family plan providing service for up to six family members available for just $14.99/month (Php674.55). Apple Music is available on your iPhone, iPad, iPod touch, Mac, and PC starting June 30. Apple Music will be coming to Apple TV and Android phones this fall.